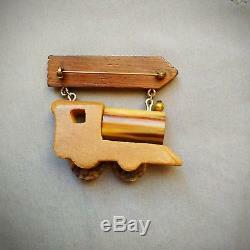 This is a vintage 1940s bakelite and wood Chattanooga Train brooch/pin with dangling steam locomotive. The boiler and the wheels are tested bakelite, the rest of the pin is wood. The brooch/pin measures 2 1/8" (5.7 cm) long (from top of the pin to bottom of the wheels) by 2 3/8" (6 cm) wide. All my jewelry is vintage or antique unless stated otherwise and has been previously worn. I will note damage, condition issues where needed, but if you need clarification, please ask. 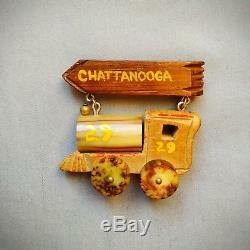 The item "1940s Vintage BAKELITE and WOOD Dangling CHATTANOOGA Train Brooch Pin" is in sale since Saturday, November 24, 2018. This item is in the category "Jewelry & Watches\Vintage & Antique Jewelry\Costume\Designer, Signed\Pins, Brooches". The seller is "zenaid2004" and is located in Roma. This item can be shipped worldwide.